Noble obsession: Charles Goodyear, Thomas Hancock, and the race to unlock the greatest industrial secret of the nineteenth century. · One Book. One Author. One Hour. Noble obsession: Charles Goodyear, Thomas Hancock, and the race to unlock the greatest industrial secret of the nineteenth century. Front endpapers contain biographical information on Charles Goodyear and his family, his stays in debtor's prisons in Philadelphia, Boston, Cambridge, and later Paris, his discovery that heat plays an important role in the production of rubber, and his difficulty in duplicating his discovery. Also included in the notes is a list of chemicals involved in the production of rubber, a reference to three failed attempts - the magnesia failure, the nitric-acid mishap, the sulfur mailbag fiasco, and a list of the names of three investors. The discovery of rubber in the 1830's is compared to the internet craze of today. -- Notes on the half-title page refer to Goodyear's failure to file for a patent right away and the sale of his secrets by Horace Cutler to Horace Day for $50. Also mentioned is the term 'Vulcanization' coined by William Brockedon for the process of producing rubber. -- Back endpapers contain notes on Goodyear's book on rubber production and its uses, published in 1853, as well more biographical information, the death of his first wife and his subsequent marriage to a woman 34 years his junior. He fathered 12 children, many of whom died in infancy. At his death in 1860 he was over $190,000 in debt. Other notes provide biographical information on Thomas Hancock, who produced the first rubber the world had seen - the eraser for pencils - and owned 6 patents. Also mentioned are Charles Macintosh, a chemist, who obtained ammonia from coal sludge, invented waterproof canvas for ships and the raincoat, and Nathaniel Hayward who sold his factory to Goodyear in 1838. Goodyear was involed in a legal battle with Horace Day regarding the extension of his patent, which expired in 1865. In 1898 'Goodyear Tire and Rubber Co.' opened its doors. -- The following questions are interspersed in the notes: "Was discovery in 1839 an accident?" - "Why didn't Goodyear become a wealthy man?" - "How many times was he sent to jail/prison?" -- Annotations by Brian Lamb in the margins and underlining of pertinent phrases throughout the book. 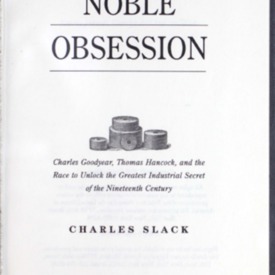 Slack, Charles, “Noble obsession: Charles Goodyear, Thomas Hancock, and the race to unlock the greatest industrial secret of the nineteenth century.,” One Book. One Author. One Hour., accessed April 24, 2019, http://booknotes.gmu.edu/items/show/697. Traces the 1830s endeavors of Charles Goodyear to reinvent rubber into a usable substance. "Goodyear Tire and Rubber Company."